Addresses joint stiffness of the elbow by using a low load prolonged stretch modality. This elbow unit features a single hinge precision gear system that converts the Model #4125 from an extension splint to a flexion splint with the simple turn of a screw. 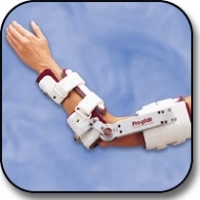 Malleable Wire-Foam� cuffs an length/width adjustments provide a customized fit for the patient. A lightweight, height-strength, air-craft quality aluminum frame assures dependability in this versatile ROM orthosis. Weight: Less than 1.75 lbs. Softgood replacement kit available. Specify right or left side. Measure bicep circumference, wrist to elbow crease, elbow to axilla. Extend patient\'s arm to end range before measuring. Joint stiffness of the elbow. #4125BL - Bicep: Less than 12\" Wrist to Elbow Crease: 8-1/2 to 10\" Elbow to Axilla: 7-1/2\" to 10\"
#4125BR - Bicep: Less than 12\" Wrist to Elbow Crease: 8-1/2 to 10\" Elbow to Axilla: 7-1/2\" to 10\"
#4125CDL - Bicep: 12\"+ Wrist to Elbow Crease: 8-1/2 to 10\" Elbow to Axilla: 7-1/2\" to 10\"
#4125CDR - Bicep: 12\"+ Wrist to Elbow Crease: 8-1/2 to 10\" Elbow to Axilla: 7-1/2\" to 10\"